President Trump's 2020 campaign manager Brad Parscale recently tweeted that "Over 90,000 kids were detained under Obama. And no one cared." What followed was a barrage of angry tweets and an attempt by AP prove the claim false by conflating two narratives; the first being that Trump is putting separated migrant children in prison-like conditions - which the left quickly abandoned after it was revealed that viral photographs depicting the caged migrant children actually happened under Obama. That claim then morphed into outrage over the Trump administration separating 20% of minors who enter the country from their parents - around 2,000 kids, while ignoring the fact that the Obama administration was also separating children from their parents, while widespread abuse of detained migrants under previous administrations was reported by the ACLU and the University of Arizona. 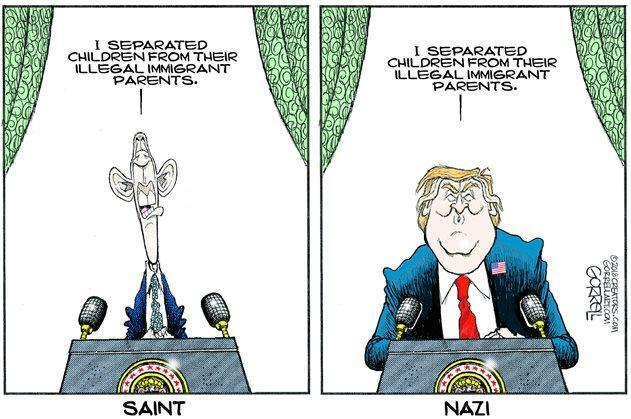 The previously silent left became suddenly outraged after President Trump's "zero tolerance" policy of enforcing existing immigration law resulted in approximately 2,000 minors being separated from their parents. To end this, Trump signed Executive Order #13841 on June 25, ordering that detained families not be separated unless the parents pose a danger to the child, while the Trump administration pledged to reunite separated families. Two days after Parscale's tweet, AP published the article "NOT REAL NEWS: Obama didn’t separate 90,000 migrant families," conflating the "separated families" narrative with the "children in cages" narrative - while pointing to a "conservative website" (which they don't link to) as the source of the claim. Note how AP simply says that the 90,000 children were placed with a sponsor... Unfortunately, they're missing a giant link in the chain; the detention centers the kids are placed in first. First, we have the 90,000 under Obama figure - but there's a footnote. Then the report notes that the majority of unaccompanied children over that two-year period were placed with a parent or a legal guardian. Now let's look at that footnote (31) attached to the 90,000 figure - which directs us to an Office of Refugee Resettlement publication entitled: Unaccompanied Children Released to Sponsors by State. Navigating over to that document on page 2, we find section "A" which outlines "Cases in which a determination of UAC (Unaccompanied Alien Child) status has already been made." And what do we find under the ORR footnote "1"? "After apprehending an individual and determining that he or she is a UAC, CBP or ICE transfers him or her to a facility run by the Office of Refugee Resettlement (ORR), which is part of the Department of Health and Human Services (HHS). In other words - all of the unaccompanied minors detained under the Obama administration were locked up in the exact same facilities the Trump administration is using. Digging some more, we find a February, 2016 report from the Government Accountability Office entitled :Unaccompanied Children - HHS Can Take Further Actions To Monitor Their Care. How about today? In 2016, the average stay was 41 days, while the Department of Health and Human Services "Unaccompanied Alien Children Program" fact sheet from June 15 states: "Currently, the average length of stay for UAC in the program is approximately 57 days." So in 2011, precious children remained in Obama's "concentration camps" as the left now calls them an average of 15 days longer than today.